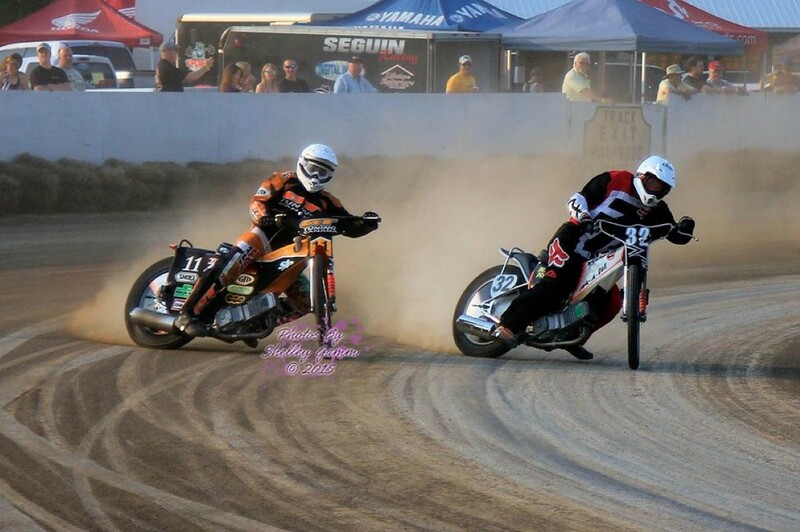 Speedway is an exciting, high speed form of racing providing a great show from start to finish. From a clutch dropping standing start, the 500cc methanol fuel machines with no brakes and one fixed gear, accelerate from 0-100 km in just 3 seconds and spend the majority of the race sideways. Few go sideways better than John Kehoe who started racing in 1981 but as a youngster, there was no racing in his family. John’s Dad, Mark, who had competed in the 50’s sponsored by the Matchless factory, sometimes talked about motorcycles and Gold Star, Manx Norton and Matchless racing bikes filled the basement. John heard stories of the Isle of Man and racers like John Surtees and Geoff Duke and Dad would often play records of the announcing of the Isle of Man. All of this helped create the foundation in his soul to become a racer. As John grew up, those bikes disappeared and there was no talk about motorcycles or racing. However, the passion was already there. He attended his first race at 8 years old and the next significant event happened on his 11th birthday: Grandmother bought his first motorcycle, a Honda CT70 and that’s when the journey began. John saw his first race in Welland in 1978. 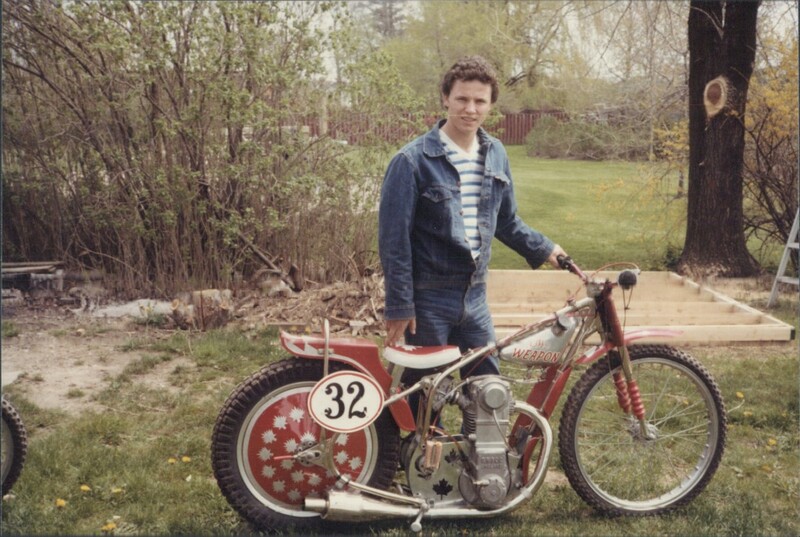 In 1980, in the basement of Jimmy Fischer’s Cycle City, he found his first speedway bike: an old Jawa two-valve for $750. Mark had also become interested, joined the CVMG and was able to find his old bike. Dad made arrangements for some track time, grabbed his 1955 Matchless and John’s speedway bike, taught him race lines and after two days of practice, John had the fever to go racing. They showed up at Welland, first race of the year and John rode Second Division speedway, won his heat, won the semi and the final was rained out. He went back the following week and won. That’s when he became a Welland Weekend Warrior. 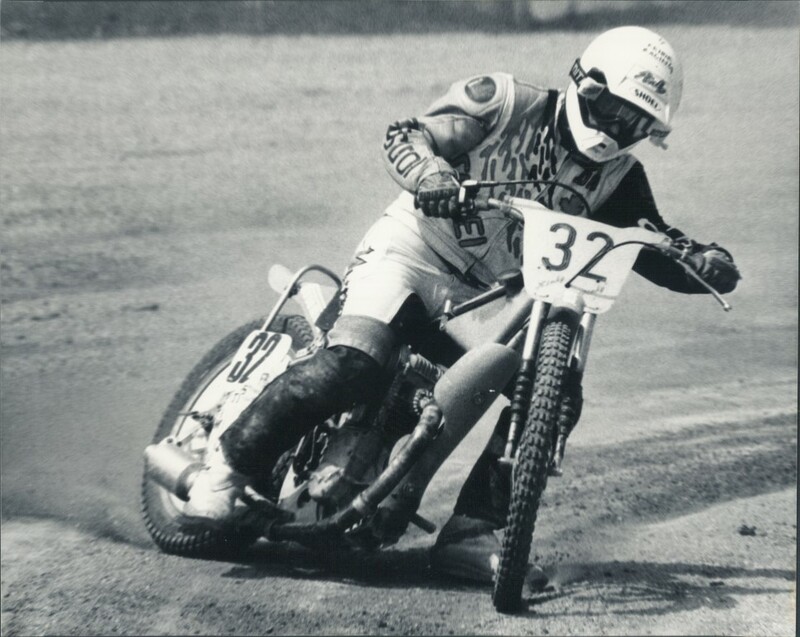 The following year, John was division one and acquired a Jawa Briggo 4-valve conversion, and then moved up to the powerful Godden, winning his first 1/2 mile at Milton in 1985. By then he was competing in all the championship races, in Ontario, Quebec and Eastern USA Speedway. 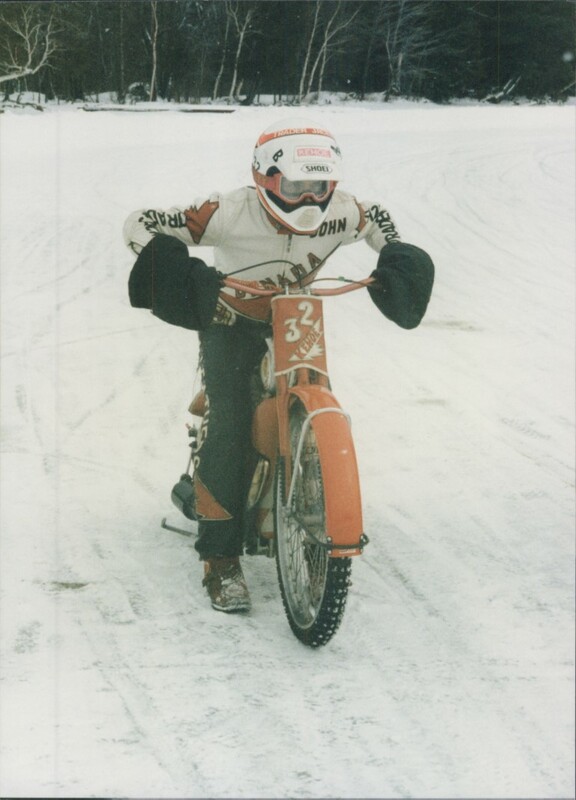 Running every week-end at various tracks with so many competitive riders soon improved his skills and John won his first Canadian Championship in 1988, the first of his 22 National Titles and Speedway #1 Plates in short track, ½ mile and ice racing. 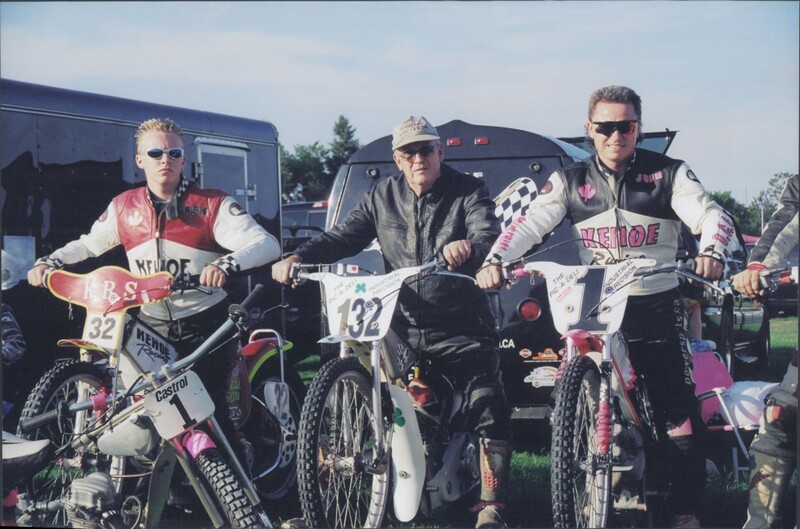 John has ridden in the First Round of the Individual Speedway World Championship in California five times, the last in 2000. Competition was fierce and it soon became obvious he needed different equipment. He ordered a new bike to be hand-built by Don Godden and beat the track record, in practice. John raced at Ascot, San Berardino and Costa Mesa in 1990. While racing in California, John met Carl Bloomfeldt, crew chief for Sam Ermolenko and that started his connection at the world level. Between his Dad’s mechanical’ abilities and a world level engine tuner, their equipment significantly improved. The last run in 1994, which was their best, Carl built an engine in consultation with John’s Dad with some innovative setups. Carl wasn’t sure about the changes but the bike was so fast, he applied them to Sam’s engine and won the world championship. Carl also sponsored John. Between the years 1995 and 2007, John re-focused his career, won 15 Canadian Championships, and the White Trophy in 1997. That’s also the time he married Martine. He raced with both his Son and his Dad and in 2001, they made Canadian Motorcycle history with three generations competing in the same National Event. During these years, John was an international crew member on the Grand Prix Circuit with Tony Rickardsson, six-time World Champion. 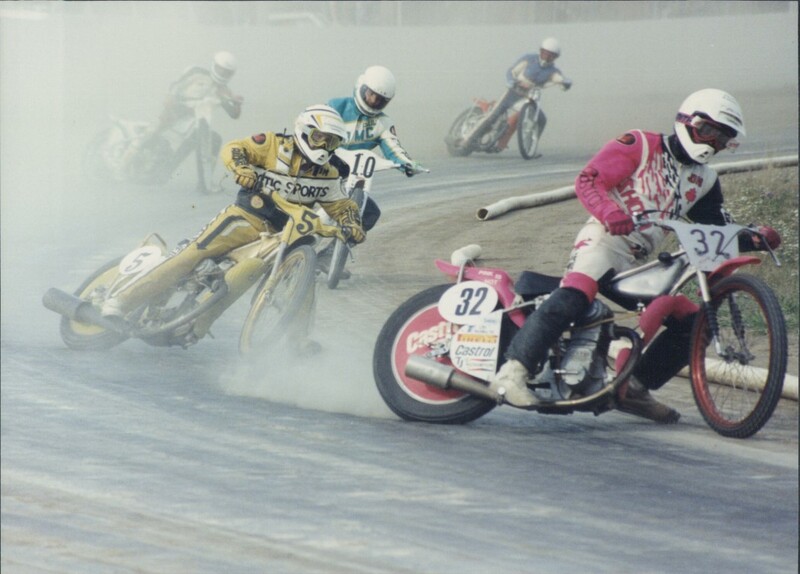 The European highlight was riding Tony’s bike, in King’s Lynn, prior to him winning the Coventry GP on that same bike. John was then deemed Tony’s foundational good luck charm and subsequently invited to attend at least one event every year until Tony retired in 2006. 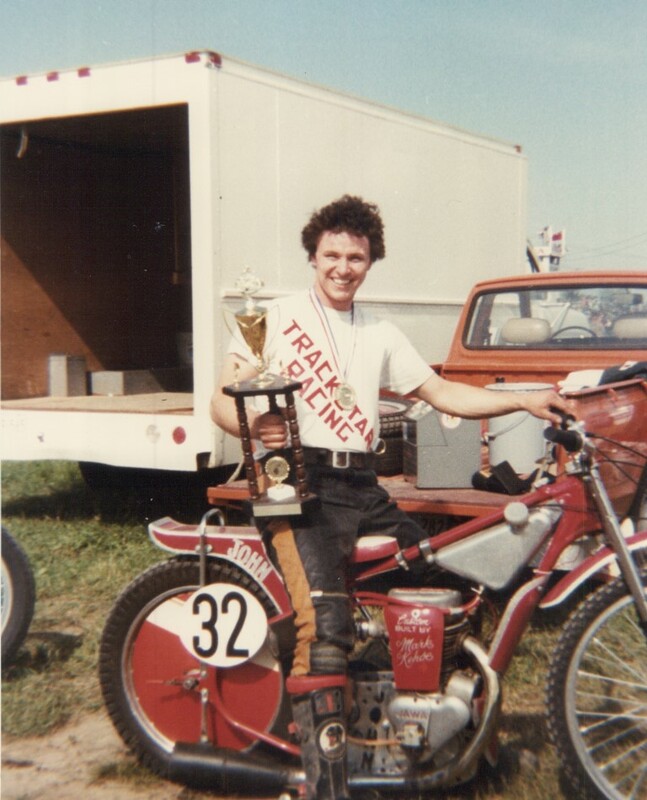 John officially retired from Speedway Racing in 2007, but after a few seasons, his wife couldn’t put up with him and sent him back to the track, with one condition: Martine wanted to give racing a try. 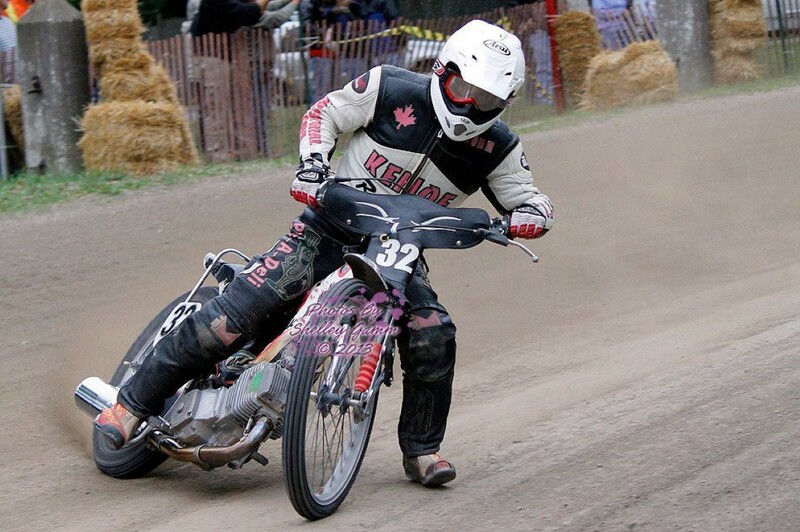 The family are now racing in the Canadian Speedway circuit, the Crusaders TT track in Medina, NY and the Flat Track Canada circuit where he again won the National Title and #1 plate in 2014 and 2015. Racing started as a family event and it has never changed.